I specialise in textile-based art, crafts and design. My work incorporates a mixture of painted or dyed silk, handmade felt, vintage fabrics, machine and hand embroidery, lace, beads, buttons and found objects. As well as creating art pieces, I also make bags, notebook covers, gifts and accessories using a combination of created and found fabrics with added decoration and embellishment. My creations are individual and unique, carefully crafted and beautifully finished. I generally work from loose ideas rather than sketches, often changing my mind as a piece evolves. Sometimes a design is suggested by the fabrics or colours; inspiration also comes from textures, photos or found items. I can work on a piece for several days or weeks, adding to it bit by bit until it feels complete. My online shop on Etsy sells a range of my hand-crafted bags, notebook covers, silk scarves and accessories. Visit my other website to see more, or my Etsy shop to buy. 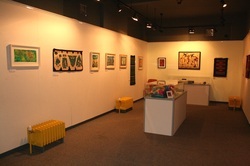 My first textile art exhibition, entitled 'Exploring Textiles' was held at Littlehampton Museum in November/December 2011. A selection of my own textile art & crafts was displayed alongside collected textiles from around the world and some interesting vintage pieces. I've since shown pieces at local galleries, businesses and open houses, as part of the Littlehampton and Worthing Art Trails. All content on this website, including designs, photos and text, is protected by copyright laws and should not be copied or reproduced in any way.